Summary: The National Geographic Photo Ark is a project in which Joel Sartore is photographing every captive species. Thirty two of these photos are showcased here, along with brief poems by Kwame Alexander. The photos are close-ups on plain black or white backgrounds. More animals appear on two sets of pull-out pages, along with their IUCN status indicating how endangered that species is. Notes from the photographer and the writer give more information about their work, how this book came to be, and what kids can do to help the animals pictured here. 48 pages; ages 4-8. 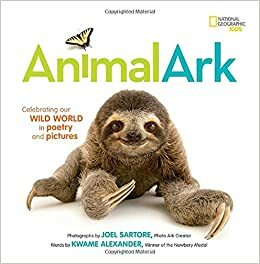 Pros: Kids will fall in love with the photographs in this book, and may even be inspired to try writing haikus inspired by them. Cons: While Kwame Alexander calls his poetry haikus, and defines haikus as having 17 syllables in the traditional 5-7-5 arrangement, these poems don’t seem to fit the definition.